What evil mind came up with this pizza combination? Was it the corporate folks at Domino's? Or some neighborhood pizzeria trying to change the world? 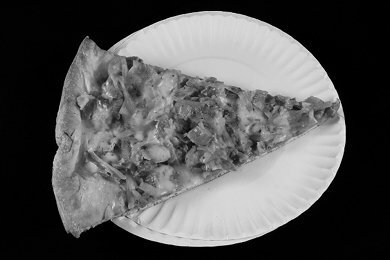 The slice photographed here was bought at Antonio's here in Amherst, Massachusetts (a college town), and is called "Chicken Bacon Ranch". We recently moved here, and I was told that this place has the best pizza in town. The number of different flavor slices blew me away. Call me old-fashioned, but I remember when you could just get cheese and added stuff like anchovies, pepperoni, and mushrooms. When did they start putting tortilla chips and salsa on pizza? I asked the owner which is their most popular slice and the "Chicken Bacon Ranch" won easily. So, because I'm Snack-Girl, I tried a slice. It was SO fatty. Cheese, BBQ chicken, bacon, AND ranch dressing, on a thin crust. The calorie content is almost TWICE a regular slice of Pizza (250 calories). Would you Like To Add Some Heroin To Your Order? I think regular Pizza is a healthy snack. And if you load it with vegetables, you are doing great! But, this pizza combination is to be avoided. I guess college students can consume the stuff because they are so active - but us 40 year olds need to stick with boring cheese pizza. Do you think this is the worst pizza on the planet? Please share below. When I read the teaser I was thinking "Oh, I hope she isn't going to say Antonio's chicken and bacon ranch,that's my favorite!" And voila! I just like plain cheese pizza as my preference anyway! I don't think I could even stomach all that grease! I'm not a fan of restaurant pizza, for mostly that reason (give me Amy's Organic frozen any day!) But I would have to say that the last time our office ordered pizza, the most popular varieties were Macaroni and Cheese with bacon and the taco pizza with everything. Hello! Pizza is on my no-no list. If it isn't real pizza it isn't worth eating so I just dream about the day when I can enjoy a slice or two or three without feeling guilty. It sure won't be chicken bacon ranch! Hate to say love Antonio's potato pizza Went to Mount Holyoke and visiting Amherst and Antonios was a pleasure!! Someone at work went to schlotskys in Eden Prairie and volunteered to get u something. The menu says sandwiches so I got a BBQ chicken with jalapeños. Saved half for the next day but never felt full. The pizza was not memorable, but I couldn't get over not feeling full all day. Make sure check first. Is it sandwich or pizza? I dont think I would like that pizza. My personal favorite is Pepperoni & Bacon. But thats a no no now, so If I eat it at all its usually just cheese now. But Totino's used to be my favorite pizza too. Best pizza for me, hands down, has tomato sauce, garlic and oregano. Nothing else, not even cheese. But the crust has to be PERFECT. All-dressed pizza is always the worst! My favorite: thin crust with onions, green peppers, pineapple, and pepperoni. So good. We love pizza although we are on a low calorie diet so it's a little tough to buy pizza therefore we have created our own low calorie pizza! We use La Tortilla Low Carb wraps as our pizza base and it works perfectly - only 80 calories per tortilla too! If you are interested, we list one of my favorite recipes (Italian Veggie Pizza - only 195 calories for the entire pizza) on our site. Hope you can enjoy too! I like pizza, and I agree that when done right it is a pretty healthy thing. Here in Italy they have this pizza with slices of hot dog and french fries on it... It looks gross. Although I have however eaten some of the fries off of friends slices with the tomato sauce on it >.<. You can also get the fries with peperoni which can't be healthy. All in all though, you can get some healthy pizzas here (grilled eggplant is amazing on pizza). There is a great local eatery here in Fargo (recently moved here) called Goodfella's. My husband gets the taco pizza, and I always get the veggie. Pizza can be a healthy alternative ~ but like everything else in the country we're trying to see how obnoxious we can make it. I remember the good old days too. Thankfully my 3 year old only knows it comes in veggie, plain, or pineapple / canadian bacon. Theres a pizza place in Peabody, MA called Bourbon Street Pizza (also called Toms Bourbon St. Pizza) That has a pizza called the Jauggernaut. This is the description from the menu, they even had to put a health warning! Mac & cheese bites, chicken fingers, mozzarella sticks and pepperoni. *We are not responsible for any health issues after eating this pizza. I hope Snack Girl gets to visit the Iowa State Fair. According to the story on NPR's "All Things Considered", this state fair boasts 50 different snacks on a stick including chocolate-covered tiramisu and salad on a stick. I think the biggest issue with this article is not the pizza. You said 40-year olds are not active. Why does that have to be? I understand that college students have more free time and lead more active lifestyles, but finding hobbies or physical transportation might allow you to eat more that "regular boring cheese pizza." I think Pizza Hut Meat Lovers pizza is the worst. All that sodium content with the meat alone. Can somebody say stroke by the slice! I actually work at a different pizza place, and I cringe every time I have to make a chicken bacon ranch. Sometimes people seem to have a death wish and get it on deep dish crust, or ask for extra bacon and cheese. We also make our own pesto that's almost entirely garlic butter and parmesan cheese, and people go crazy for it. I only eat the calzones, and I stuff them with just veggies and skip the cheese. To save money (and calories) our family often makes pizza on Friday nights (Our usual pizza night). We have used whole wheat tortillas, spinach tortillas, Flat Out wraps, pita bread, as well as the Middle Eastern naan (delicious, but upwards of 250 cal/ slice).